Homeless shelters that can be built in around 20 minutes without tools. Did political theater in Seattle this week showcase a practical solution? If Seattle had a natural disaster requiring temporary housing to be built quickly and cheaply, it might look like the shelters built by the Everett company Pallet. With aluminum frames, lockable doors, insulation and ventilation, the shelters can be constructed in around 20 minutes without tools. 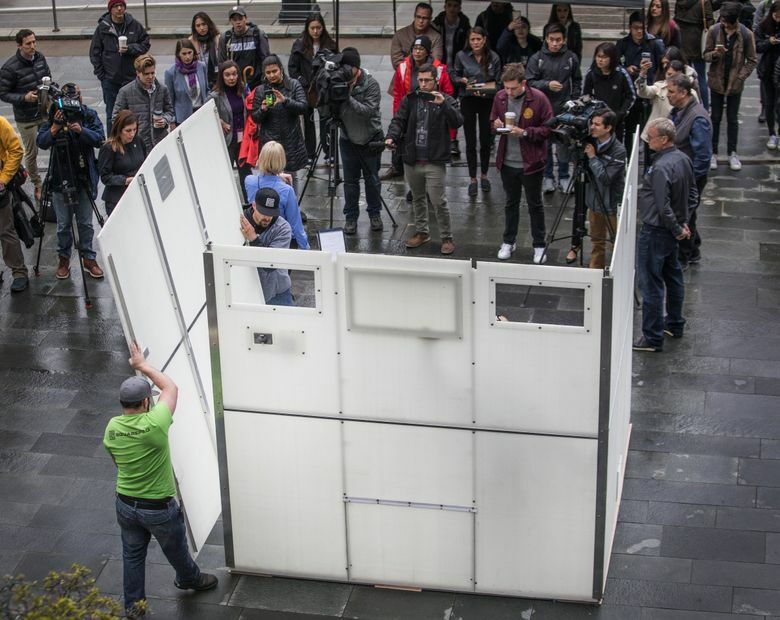 A 64-square foot shelter, with four bunks, costs between $3,500 and $5,500. 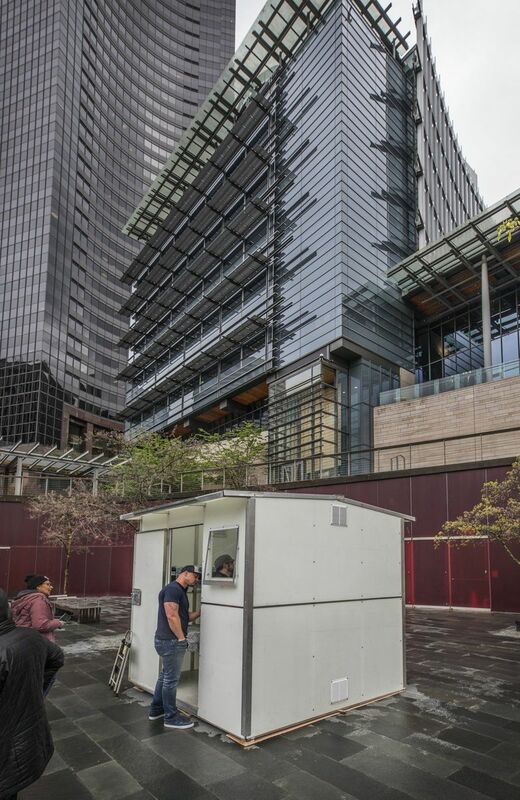 On Thursday, workers assembled one of them outside City Hall, some political theater intended to push for a disaster response to the city’s homelessness crisis, and what Seattle City Councilmember Teresa Mosqueda says is a lack of urgency. Tacoma has taken a similar approach, setting up a large, industrial-style tent shelter with case-management services, shower and laundry trailers paired with 40 of the “pallet” shelters, where people can move once they get more acclimated to living inside again and on the road to more permanent housing. In Lynnwood, a tent city called Shepherd’s Village had tents replaced by these shelters in October, according to The (Everett) Herald. 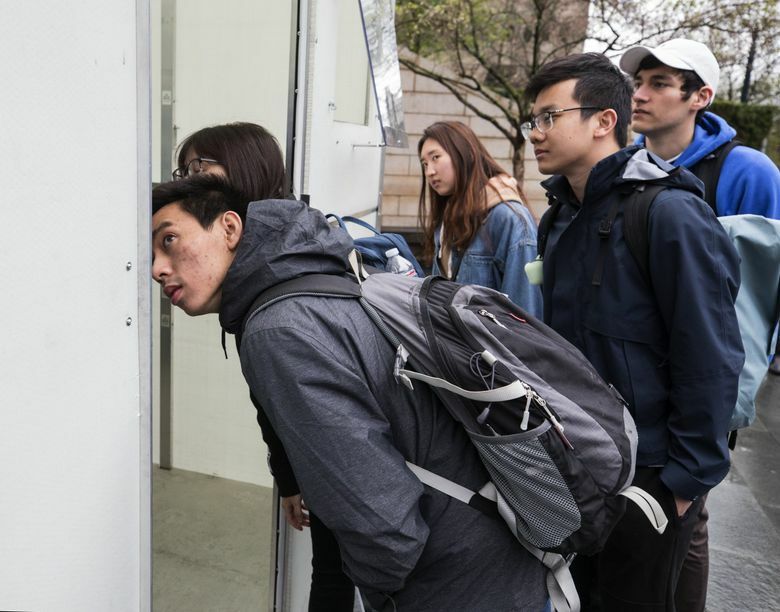 Seattle’s short-term strategies have focused on opening shelters, which are consistently full and can be difficult to open, and tiny house villages that have been hard to move and sometimes resistant to the city’s directives. Meanwhile the city is being sued by left-leaning advocates, and criticized by business groups and neighborhoods, for its approach to removing unsanctioned camps. Mosqueda asked for $3 million in October to be designated for an industrial-style tent shelter, similar to Tacoma’s, but that request didn’t make it into the 2019 budget. Another $2 million would be needed for operations, city staff told The Seattle Times in October. The Tacoma site cost around $900,000 to set up, roughly $2.3 million a year to operate, and houses around 90. Mosqueda said her staff and others at the city are looking at some of the vacant parking lots, Port of Seattle land and county land around the city for the right location. Everett’s Pallet company hires formerly incarcerated and homeless workers to build the shelters, some of whom assembled the shelter at City Hall. “We understand housing takes a really long time — this is meant to stand in the gap,” said Amy King, CEO of the company. 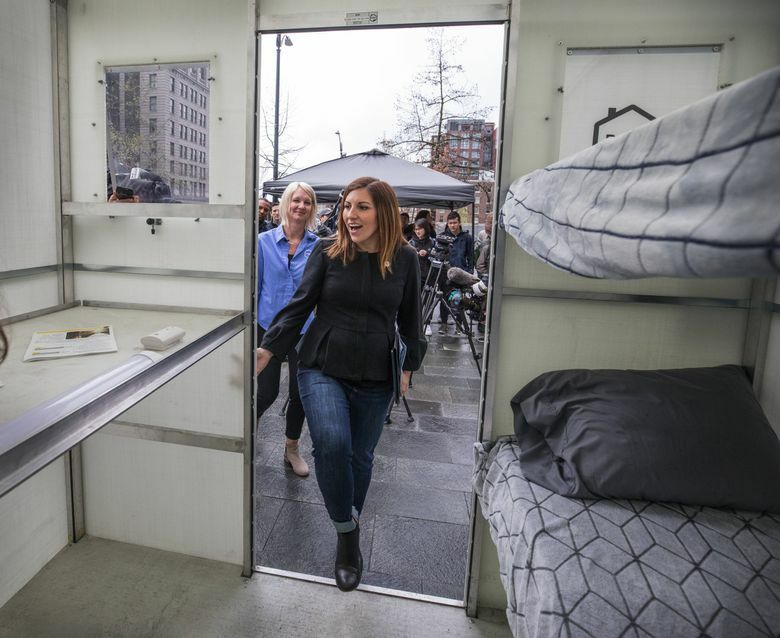 Mosqueda said she would push for city funding, and potentially federal money, to buy the shelters, but stressed that this is only a temporary measure. “Unless we’re building housing on the horizon, these folks are still homeless,” Mosqueda said.